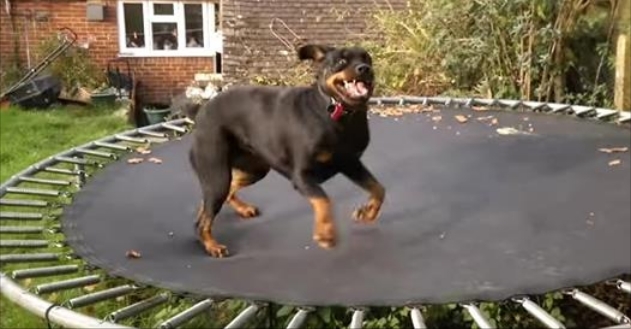 The clearly excitable Rottweiler may very well be the bounciest dog around, and she's not ashamed to show it. Here she is now on what, in her opinion probably, is easily the best invention ever created — this incredible bouncy thing. Moderately active Rottweilers will appreciate a couple of 10- to 20-minute walks each day. They also enjoy playing with balls and going hiking. More energetic Rotties may need longer exercise times and more structured activities. Their athleticism, intelligence, and trainability make them well suited to agility and obedience competition, as well as tracking, therapy work, and their traditional job, pulling a cart or wagon. Perfect for parades! Responses to "Dog Really, Really Loves This Incredible Bouncy Thing"